SIX QUESTIONS WITH A WATERMELON CARVER: LAURA POULSEN - What About Watermelon? In our first “Interview with a Watermelon Carver” last month, we got to know one of our most entertaining watermelon carving contest participants, Ryan Allison. This month, we talk to Laura Poulsen. Like Ryan, Laura is also a passionate watermelon carver. She enters the carving contest each year, but she also sends photos of her carvings throughout the year to the folks at the National Watermelon Promotion Board. 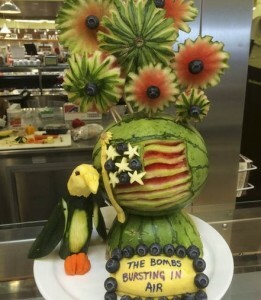 In the 2014 carving contest, she took first place in the Watermelon Basket category (right) and second place in the Star Spangled Watermelon category (below). I sat down with Laura (she’s from Portland, Oregon) recently — well, I assume she was sitting when she answered my email — and here’s what she had to say about her love of watermelon. TELL US A LITTLE ABOUT YOURSELF. WHEN YOU’RE NOT CARVING WATERMELON, WHAT DO YOU LIKE TO DO? My husband Stephen and I love to go to antique and collectible shows, and have been doing so for many years. We have quite a collection of small rabbits carved out of every substance you can imagine – amber, turquoise, boxwood and much more. At one time I sewed teddy bears using old, recycled fur coats – I made over 900 of them! And yes, I made a rabbit too! WHAT INSPIRED YOU TO START CARVING WATERMELON? It started with me making small garnishes for plates in my deli case. 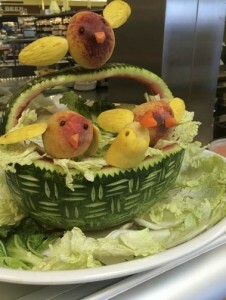 Over time, the garnishes got more creative and elaborate and my carving evolved. WHAT SORT OF CARVINGS DO YOU LIKE TO CREATE? I really love working with watermelon because, for me, it’s a good canvas. With watermelon you have the patterns on the rind as well as the different layers of color (depending on the depth of the cut) to help bring out a design. For example my Cheshire Cat carving worked out so well because of the stripes. I also love watermelon because it is so easy to carve. Different fruits and vegetables “talk” to me with their shapes and colors. For example, I made love birds out of mangos, an owl out of a pineapple, an Elmo out of red peppers, an octopus out of an eggplant and more. WHAT’S BEEN YOUR MOST MEMORABLE WATERMELON CARVING? My most memorable watermelon carving is my Cheshire Cat! One day, as my husband was driving me to work, I was fretting about what I would make that day. We were talking about the day and just as he was dropping me off, it came to me! I’m going to make a Cheshire Cat! My husband’s brother Mark was in town that day and he was going to come in to see me at the store. He has always loved the Alice in Wonderland story and the Cheshire Cat character, so that was how it started. I went to the produce department and saw the perfect watermelons for the project. Mark came in later that day, saw it on the deli counter, and knew right away it was made in his honor. WHEN IT COMES TO EATING WATERMELON, DO YOU PREFER CHUNKS OR WEDGES? I prefer melon balls! My husband likes wedges. WHAT’S NEXT FOR YOU AS A CARVER? WHAT WILL YOU BE CARVING THIS YEAR? I’m a crafty person that likes to be creative. I am eager to try new things and learn new techniques. It is sometimes a challenge to come up with the idea for the next project. Sometimes I don’t know what I’m going to make until the last minute, and sometimes I take inspiration from characters or things from the books. People come into the store every week just to see what I have created. Sometimes they take pictures to send to friends and family all across the country. I love to make people smile and the carvings become a way to start conversations and make people happy.